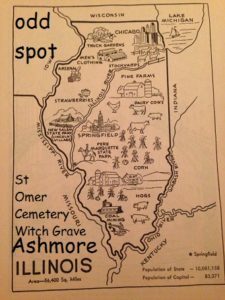 The old St Omer Cemetery in Coles County is said to be home to an obscure but enduring legend that has haunted this defunct town for generations. Dated Feburary 31, the glowing tombstone on a moonless night is said to damn those who attempt to take it’s picture. Join us for this dark tale of haunted history and cemetery horror as we continue the frightening tales of ODDTOBER.